Introduce young students to the concept of maps as representations of places with this neighborhood map. Students in early elementary commonly draw their view of the world using the perspective seen in this map. Students can use maps with this perspective to begin to learn spatial concepts such as identity, location, and symbols. They should be given opportunities to practice with maps of familiar places, like a neighborhood. At this age, symbols should represent an object or place in the real world and be a recognizable icon to students. Abstract, unrelated symbols are not understood well at this age. 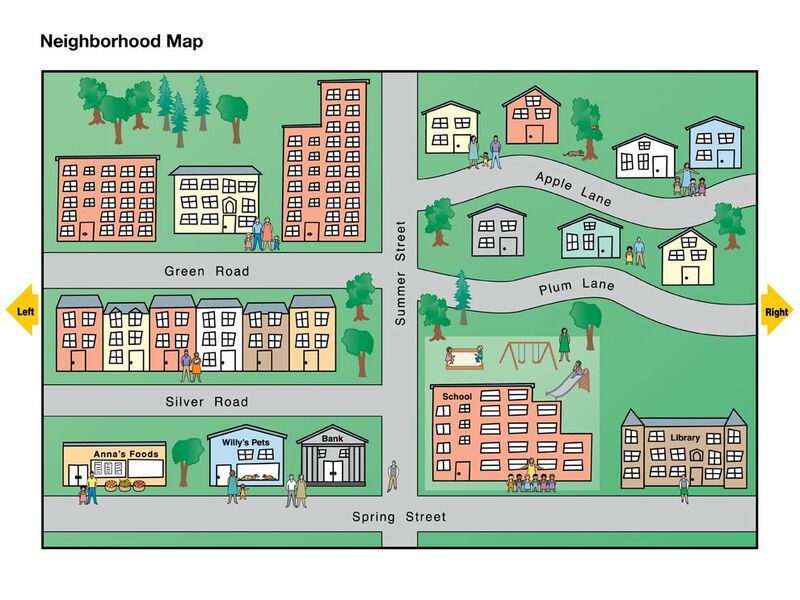 Use the text and prompts below to explore the provided neighborhood map with students. A neighborhood is a section of a town or city. Look at this map of a neighborhood. It shows residential and business areas and some of the main streets and buildings in the neighborhood. Symbols on a map are drawings that stand for real things. This map doesn’t have a key. How can you tell what the drawings mean? Find the grocery store. Where is it located? What street has no houses on it? The school is at the corner of two streets. What streets are they? Find the pet store. Between what types of buildings is it located? This neighborhood has a tall apartment building. Find it on the map.